Home News Views From... We Ain’t Afraid of No Ghosts…etc. We Ain’t Afraid of No Ghosts…etc. It’s been a nasty day in the neighborhood (region) with a lot of the mountaintops getting rain, freezing rain and generally yucky precip. We should see some back-side snow from this over the next few days. Today, I am addressing some negative nellies who seem to have a bit of a misunderstanding of who SkiSoutheast is and what we believe our mission statement to be. To begin…I should answer the question of WHY am I even addressing this when 95% of you, our readers, will be oblivious to what I am commenting on. After all, most of you come to this website to see “any good news” that we can share about what’s happening around the region on the slopes. …being scared to publish anything negative for fear of repercussion. …being bought out or paid to tote the party line. Another round of railing occurred on Tuesday via Facebook and again we replied to it and attempted to use logic in our response – only to be accused (again) of being fearful of posting anything negative. Again the inference was made that SkiSoutheast is being “bought out” and therefore that would be the reason why we would suppress certain commentaries. After suppressing some content, I received several emails – burning more time than I care to share. On Tuesday, one person even brought up another resort General Manager and our own, Joe Stevens – referencing how frustrated they must be with SkiSoutheast in that we won’t allow certain attack-style commentaries on this website. I can only tell you that I have constant communications with Joe Stevens (at least twice a week) in his various roles as Spokesperson for the West Virginia Ski Areas Association and as a writer on staff – and while I can’t speak for Joe, I CAN share that he has not once discussed our stance on suppressing certain kinds of negative commentaries. I can also share that I have spoken with most of the region’s management and marketing staffers and they too seem to be appreciative of how we operate. I have also attempted to handle responses via email in an effort to use logic to explain our stance and regardless of those efforts we continue to hear from people who seem to feel that they are in a better position to decide what the function of our website is and there are also those who feel that we “owe it to readers, to tell the truth” as if we aren’t already doing so. Every few seasons it seems that there is a ski area or two that “fans” seem to want to rant and rail against about under performing. Not staying open long enough into late March or early April. Not making snow as often as other resorts. Not opening slopes quick enough…or as many slopes…or all their slopes. Slopes are always refrigerator ice hard. Resorts misrepresenting trails open, when they are not. Not being open for night skiing. Being too focused on real estate and not enough on the slopes themselves. Overzealous ski patrollers pulling lift tickets. Resort staffers and management being rude when confronted with a complaint. Not offering refunds when the slopes are not good enough to play on. Being stuck on a lift when there are equipment or power issues. Being open and charging full price when the slopes are in terrible shape. Being closed when there seems to be snow on the slopes. Not closing on rainy days. …and the complaints go on and on and on and trust me when I share that over the years we have received thousands of such emails about every ski area in the region. This particular season, there have been three ski areas that have caught the most negative attention in terms of emails that we receive. Now that we have entered the social media age, people seem to feel it necessary to vent those complaints anywhere and anytime they want…without thought as to whether they are truly warranted, fair, etc. They also don’t seem to care if those opinions effect whether someone else visits that resort, or maybe they DO and that is their intent (to harm the ski area in question). SkiSoutheast.com is not here as a place to vent those frustrations…although it seems to be the consensus that we are, or that we should be. There is a time and place for everything, but this isn’t the place, nor is now the time. The place and the time might be via online review services like TripAdvisor or perhaps even our own messageboard – although we do have basic rules of proper etiquette that are mostly common sense with a healthy dose of the Golden Rule thrown in for good measure. SkiSoutheast is NOT part of any association or organization. We don’t have any allegiances to any ski area (other than the fact that we love them all) and nor do we have any agreements in place that prohibits us from making negative commentaries. Lately I have personally fielded dozens of emails and Facebook messages that hinted that we are afraid to make negative comments about a ski area. That simply isn’t so. Those who have made those claims are doing so in hopes of inciting us to get into a he-said, she-said battle of words and wits. Those who have made those claims have likely not followed this website for long. Over our 22+ seasons, we’ve written our fair share of rants. So there is no fear here in reporting. What we are NOT going to do…is report opinions and especially opinions that are individually and negatively pointed at specific people…ie, owners or managers of a resort. Those opinions are often disguised as “not sharing this news is not good for the industry” etc. but we’re just not going to go there. End of story. We could get into specific scenarios where people could argue that readers deserve to know if there are dangerous or tricky trails or dangerous employees working at a resort all under the guise that ‘someone is going to get hurt’, however, those are just opinions that may never surface. If there are those of you out there that don’t like that, start your own website and go for it. We believe our job is to report and inform potential visitors as to what each resort has to offer in terms of amenities, trails open and the condition of those trails. We are not here to discuss the personal lives and actions of a resort owner or manager. We are not here to discuss lifts that might be thirty years old and that they might break down. Heck there are ferris wheels operating in the region that are 65 years old! We can talk about inspections all day long, but there are inherent risks in every adventure. At some point everything breaks. What I have found through most of the negative posts and emails that I’ve read is that people are simply using anything that they can allude to in an effort to discredit an individual or a resort management crew or set of owners. They can put lipstick on that pig all they want, but to me the intent is clear. They aren’t happy with a person and they want to rail about them. 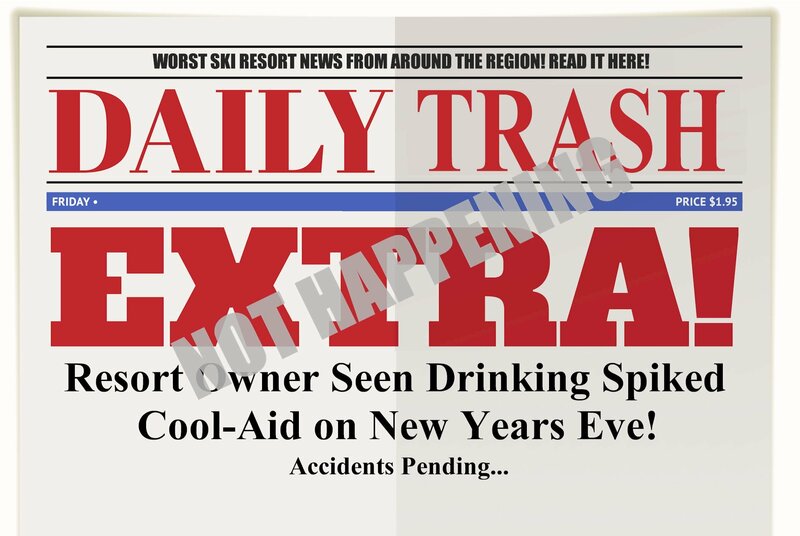 We are very aware of the fact that there are at least two anti-resort webpages out there currently railing against two different ski areas in the region. We’re not going to promote those pages by mentioning them here – other than saying that they exist. The intent of each of those pages is pretty obvious. However, here at SkiSoutheast.com we choose NOT to participate in that kind of negativity. If we were to start down that path I can assure you that we’d be doing nothing but feeding the wolves that are circling at all times around most every ski area in the region. That would certainly not be of service to the industry or our readers. So for those of you who still don’t get it…as simply as we can say this – we are not going to become a ‘tabloid style’, negative reporting service. Time to move on. Nothing else to see here.